Collimation isn’t too well understood, but I don’t suppose it needs to be, provided you know how to “do it”. Collimation really means ensuring the various pieces of the optical train are in line and square with each other. When we buy a telescope, we assume, that it’s perfect, and accept the views we get with it as normal for this type of instrument. But it’s worth a check. Collimation is really quite a big subject, but can be dealt with fairly simply for our purposes. First, how do you know your telescope isn’t “perfect”? In simple terms it doesn’t give you clear images, the image is slightly fuzzy, but many other problems can give the same result, from bad seeing, to fingerprints on the eyepiece. But you don’t need to investigate what’s causing the problem yet, just check for bad collimation to eliminate it as a cause. How? Wind the image of a star out of focus and if the rings or discs you see are concentric, you don’t really have collimation as a major fault. Though you can always improve it. 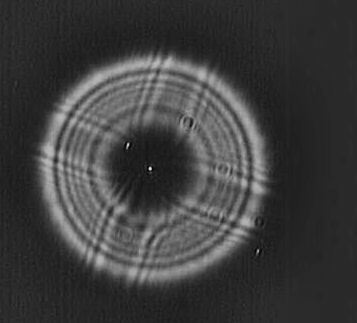 The ring pattern as seen on a laptop screen, not fully concentric though. So, do all telescopes suffer, or does this affliction only occur in certain breeds? All telescopes can get this problem, but some are more likely than others, I suppose it’s in the genes. Refractors are the least likely to suffer and accordingly few have the means to correct it, only some very high end refractors have the adjustment, 3 screws, built into the objective lens cell, to correct bad collimation, though you don’t expect to have a collimation problem with them anyway. The only way to correct a normal refractor with bad collimation is to send it back to its Maker. Reflectors? Yes, all types. The degree of affliction is dependant on the design and quality of its execution, but, by and large, all reflectors suffer. The test as before, use a medium magnification eyepiece, focus on a mag 3 to 6 star, in reasonable seeing, when the star doesn’t jump about. Make sure it’s in the centre of the field of view too. Now unfocus it so that big circles, discs are produced. Important points are, make sure the star is in the middle of the field, as other problems will start to interfere if the star is off axis. And make sure the primary has had time to stabilise its figure. This comes when the temperature of the primary matches the ambient temperature. It can take an hour from getting the telescope out and set up. The “figure” is the shape of the primary’s curve; it changes with temperature. These are only very small amounts but they can be seen in the eyepiece. A closed tube reflector will take much longer than an open tube reflector. But you can do most of the work without waiting, though with less perfection. SCT’s, like Meade and Celestron products, have a pierced primary so you only have one means of collimating and that is by adjusting the secondary, where 3 screws are provided. Newtonians? You must first mark a central spot on the primary, draw a small circle there with a felt tip pen. Sacrilegious? Yes, but be adventurous, after all, the secondary hides this area, so it isn’t a working surface. Make sure the circle is accurately in the middle though. Then looking through the focuser, preferably using a long extension tube so as to get as far back as possible making the eye line through the focuser to the secondary as central to it’s axis as possible (a tube with a small central hole through it will help too, though much more difficult to use), adjust the secondary side to side etc. till your circle on the primary is right in the middle of the field of view seen through the focuser, and concentric with the rim of the secondary. Stage two is to remove the tube and extension and put a low magnification eyepiece in, and get a star in the centre of the field, and put it out of focus so that the circles are seen. This applies to SCT’s too. In Schmidt Cassegrains, the adjustment is in the secondary. In Newtonians the adjustment is in the primary. Adjust the screws, a little at a time, trying to remember which screw, which way, till the circles are concentric. After each adjustment, which will take the image to one side, return the image to the centre of the field before making a judgement on that adjustment. That puts quite a lot of work into a few words, particularly if your collimation is far off and you have no drives. Your telescope may be quite long and your arms short, so you can’t see what you’re adjustments do till you’ve got your eye to the eyepiece again. It can be time consuming, but persevere in little steps, don’t be tempted to use a hammer and chisel. A remote eye, in the head of a friend helps, but a webcam is better, and easier on the temper. When you’ve got the rings concentric both sides of focus, yes, both sides of focus, this means winding the focus through the focus point and beyond, stop for a cup of tea. Then change to a higher magnification eyepiece, and start all over again. Then on to a higher magnification eyepiece and repeat. If you want it to be as good as possible, add a Barlow and do it again. But you’re approaching the point of diminishing returns. So judge when to stop to suit your needs. When you get to using more than 2x barlows for this job you’d better start thinking about all the other problems that affect the image you see in the eyepiece. There are many refinements to consider, but none that makes giant improvements. That’s all there is to it, so get on with it. You’ll not regret the work. Oh, another point. It pays to check collimation every time you use the telescope till you get to know how well it holds collimation. Some hold it well but still need it checked from time to time. Others don’t hold it well at all but that generally applies to older and cheaper reflectors. My preferred way is to use a webcam so I can stay at the working end of the telescope and make adjustments with more care. The chip is so small that the image will always be on the centreline of the telescope or it flies off screen, which forces you to make small adjustments. The picture I see of the rings is much bigger on the screen of the laptop, and with two eyes it’s easier to judge concentricity. I did this work on our new telescope, the Vixen VMC260L, the other night, standing on a rickety folding stool in the dark with the telescope pointing almost vertically and the secondary at about my eye level, with the laptop on the floor. So with a tiny Allen key in one hand ready to drop onto the primary, and drive controller in the other and my knee against the pier to steady myself. I made the adjustments, but without a Barlow. It’s reasonable now but can be made better.